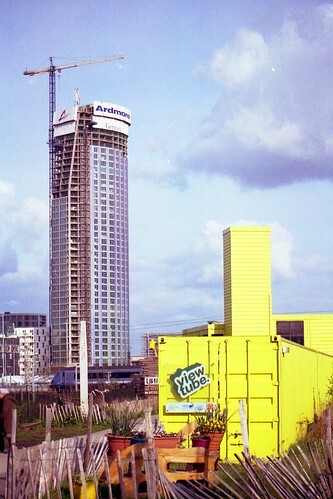 Another shot from film, the View Tube container café is dwarfed by the development on Stratford High St.
One of the big problems I have with film is that quite often I don’t get though a roll very quickly – which means photographs lay in the camera undeveloped or seen for literally years. Last year I cycled to Southend as part of the coast to coast training – around 35 miles which I did enjoy and it’s nice now having the photos to think back to that day! 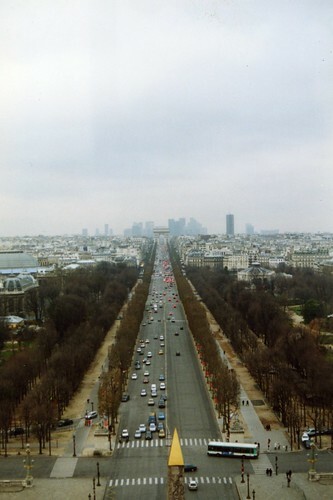 It’s very nearly 10 years since I took this shot, from the ‘Paris Wheel’ in Place du Concorde as part of a sixth form school trip. So this is a fitting time to return to Paris as a ‘grown up’ and actually stay in the city! As per usual, I’ve hundreds of photos to sort though – I think back in 2001 maybe I shot 2 or 3 rolls of 36 exp and lost half of the prints – how times change! I finally made it to the top of the Eiffel Tower, promenaded round the gardens of le Chateau de Versailles with the lovely Ruth and much more. It’s been lovely to try to speak French even if I have lost a lot of the skills. More musings to follow – it’s a fascinating city. Pontoon, originally uploaded by Alan Perryman. An archive photo, this one from August 2002 from the Tall Ships gathering at Zeebrugge. 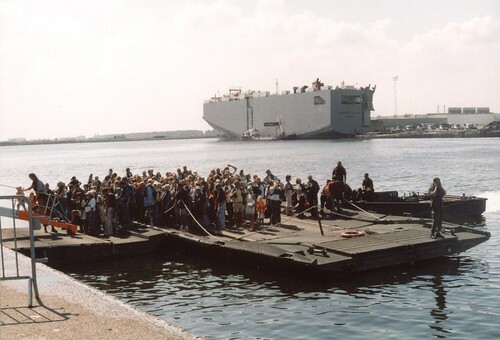 The Belgian navy were pushing this pontoon across the dock using a small boat. Health and safety precautions? That rope keeping people away from the edge of the pontoon! 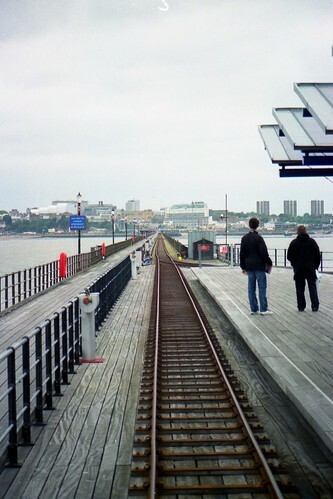 For the camera geeks, this was taken using a 35mm film SLR, Fujica STX-1 with a 50mm lens. I have absolutely no idea what the settings were…apart from wrong, given the largely bleached out sky!